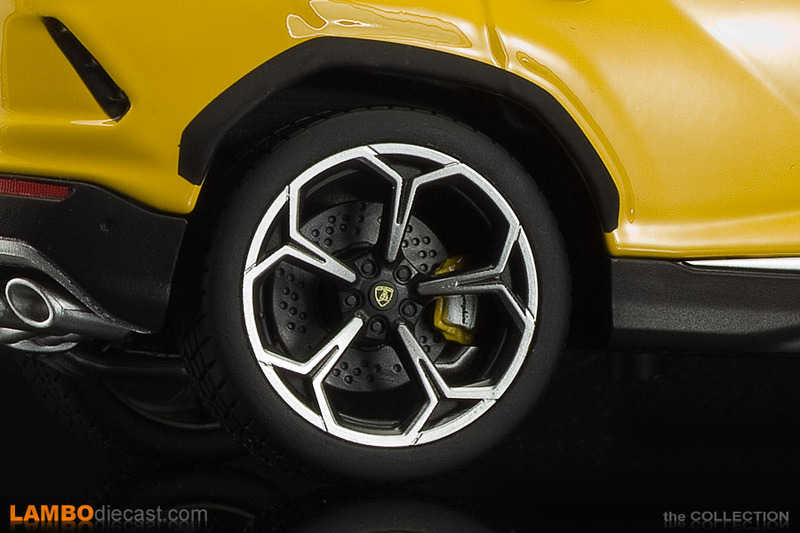 When Lamborghini unveiled their new Super SUV at the 2018 Geneva Auto Show, Bburago already had a 1/18 scale model ready, many people bought the scale model right on the stand at the show, me personally I waited a little longer for the model to become available at my online shop ... who listed them at a much lower price, but that was to be expected. 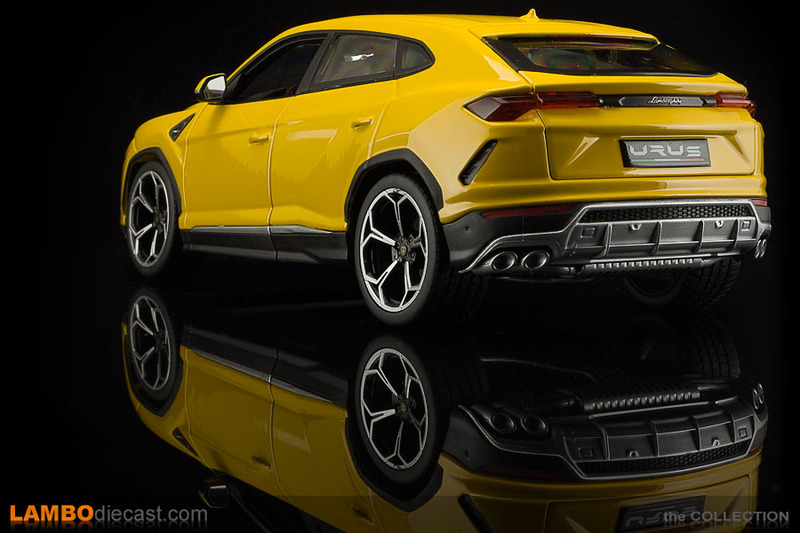 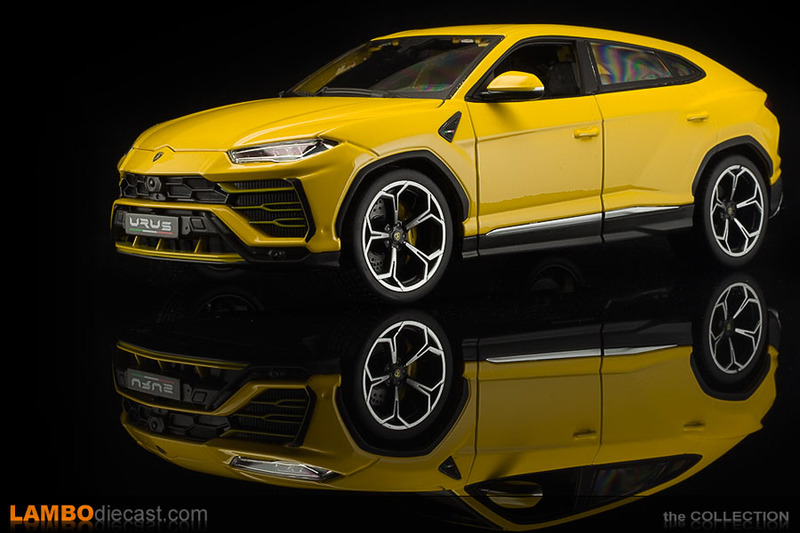 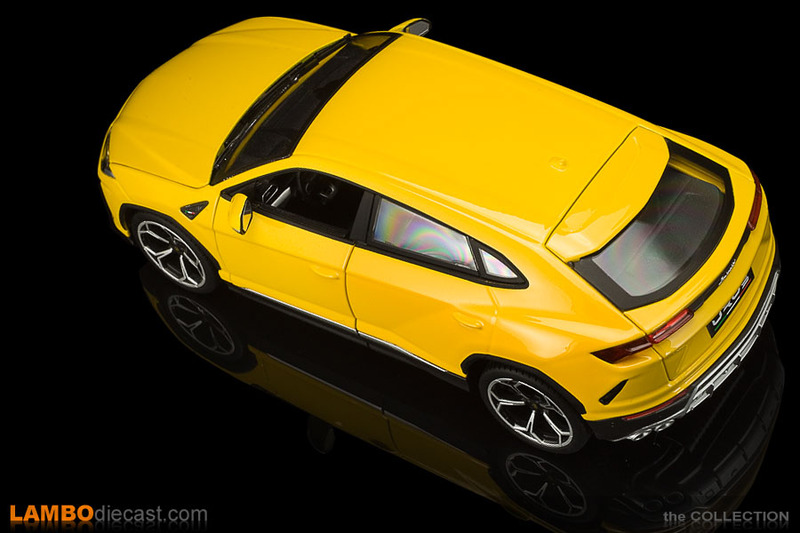 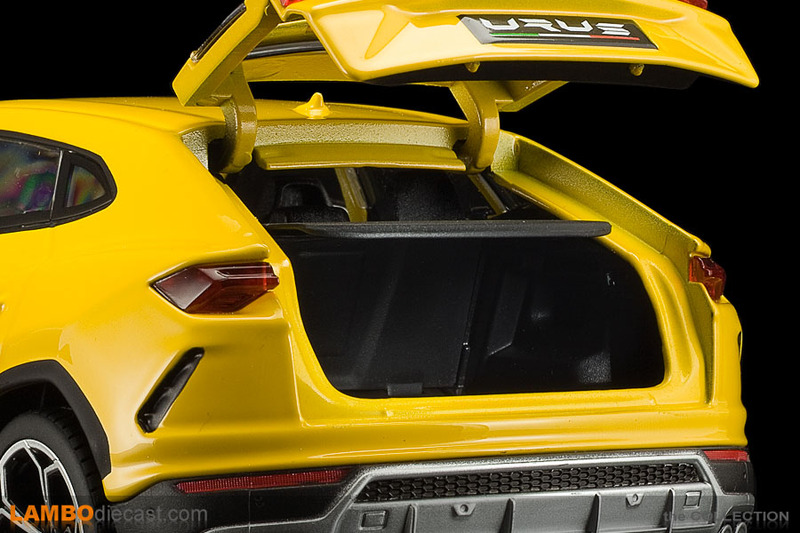 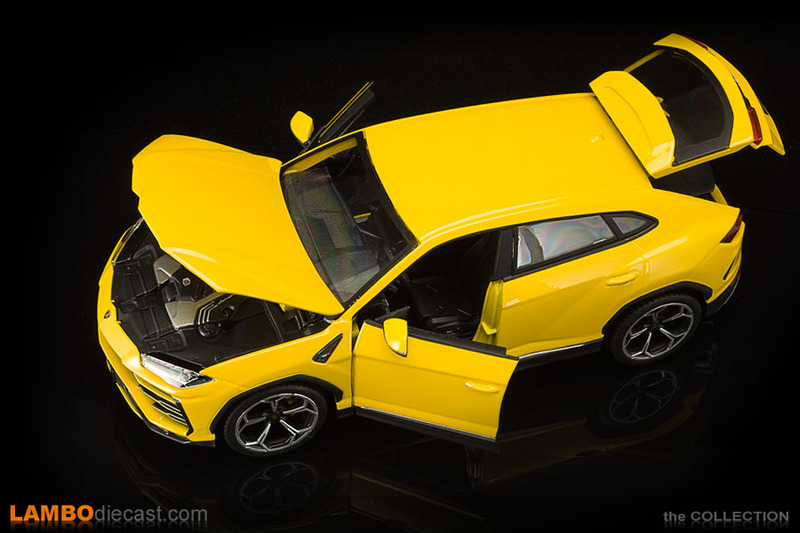 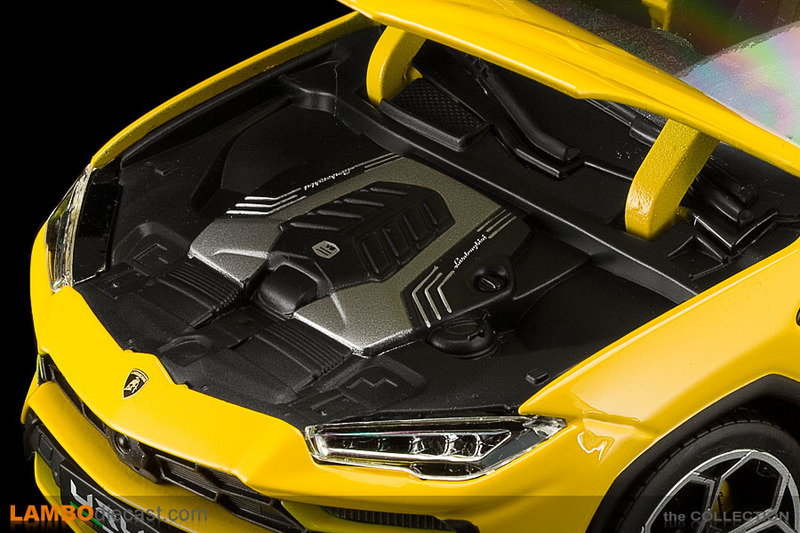 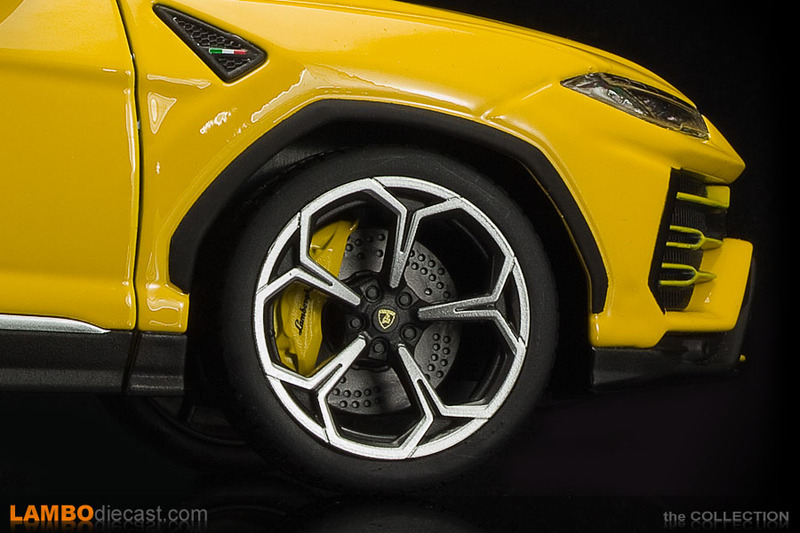 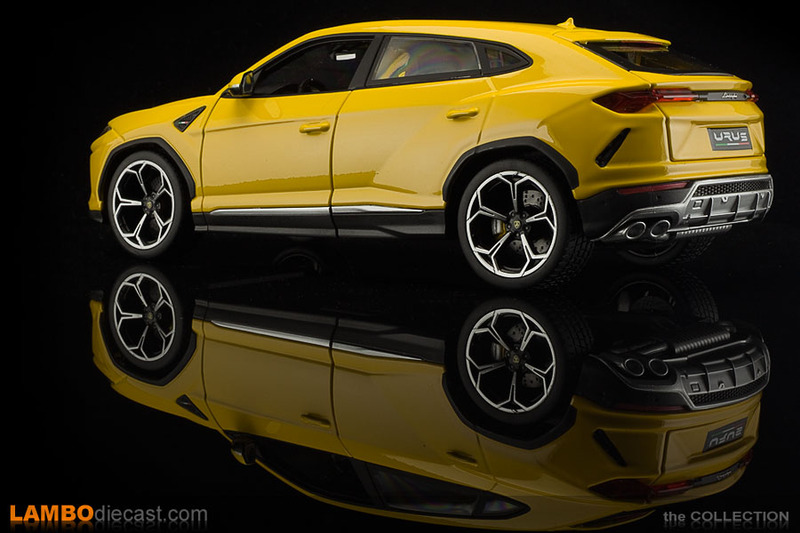 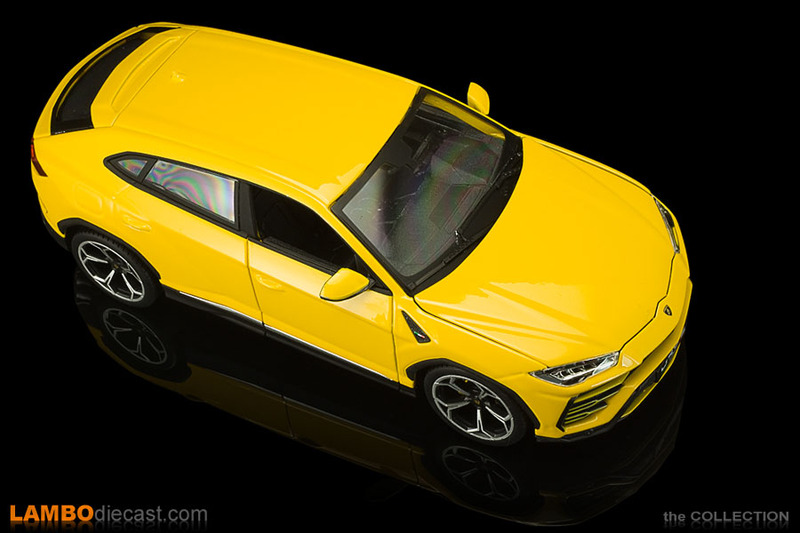 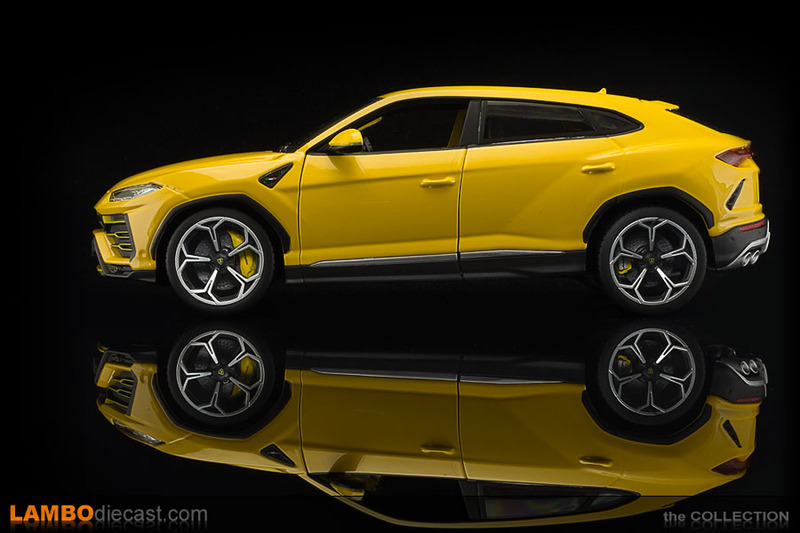 So Bburago has two shades available for the Lamborghini Urus, the Grigio Lynx, and this Giallo Auge, both shades were also used in the official press release for the Urus, only difference are the wheels ... for the presentation of the real car Lamborghini fitted the optional 23" Taigete wheels, Bburago opted for the 22e Nath wheels, which isn't a bad option either, to be honest. 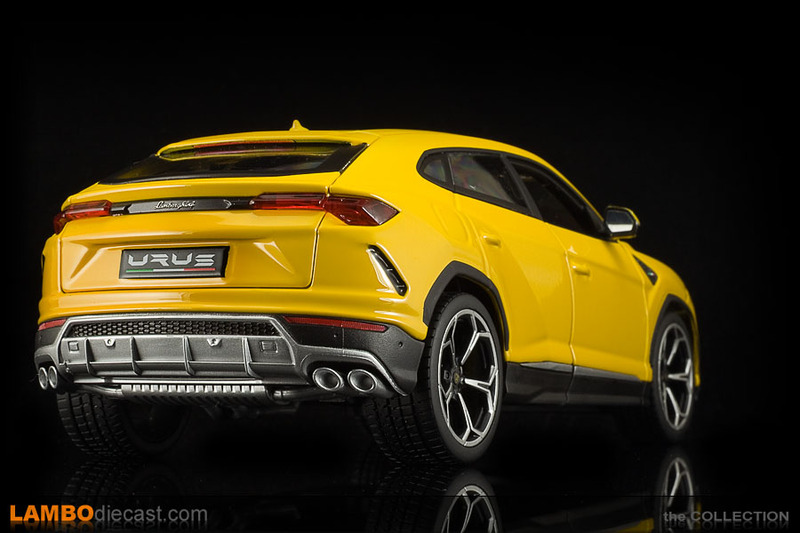 The Lamborghini Urus is the latest off-road model from Sant'Agata, and while many call it the successor to the legendary LM002, the Urus is in fact aimed at a totally different market, while the LM002 was an off-road monster with a massive V12 up front, the Urus is much more refined and uses a twin-turbo V8 engine ... the LM002 derived 450hp from that massive engine while the Urus comes up with 650 hp, incidentally both models have the engine at the front. 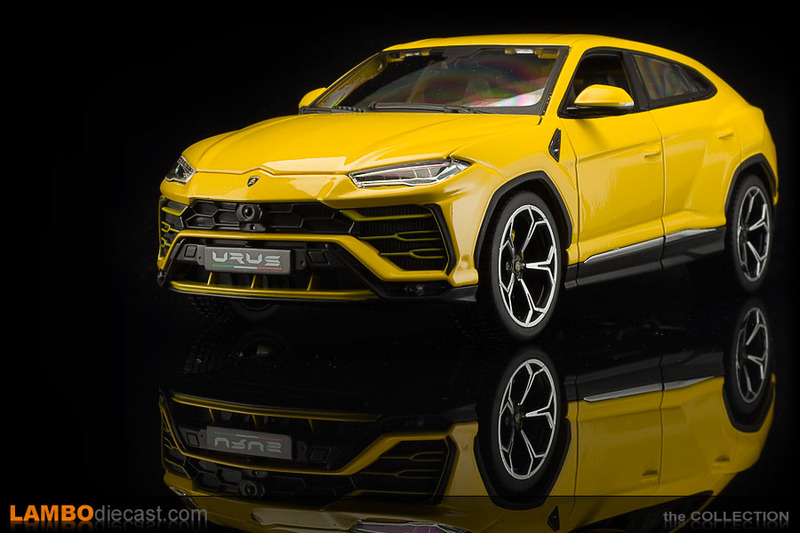 While the LM002 came with four 'Countach' style seats on the inside the Urus is a five-seater originally, but you can opt for a four-seat configuration to mimic the LM002 style, with dimensions of 4900x2000x1850mm (LxWxH) the LM002 is actually smaller than the new Urus which measures 5112x2016x1638mm and weighs 'only' 2197kg compared to the 2700kg of the LM002 ... so it is safe to say the Urus will outrun the LM002 easily. 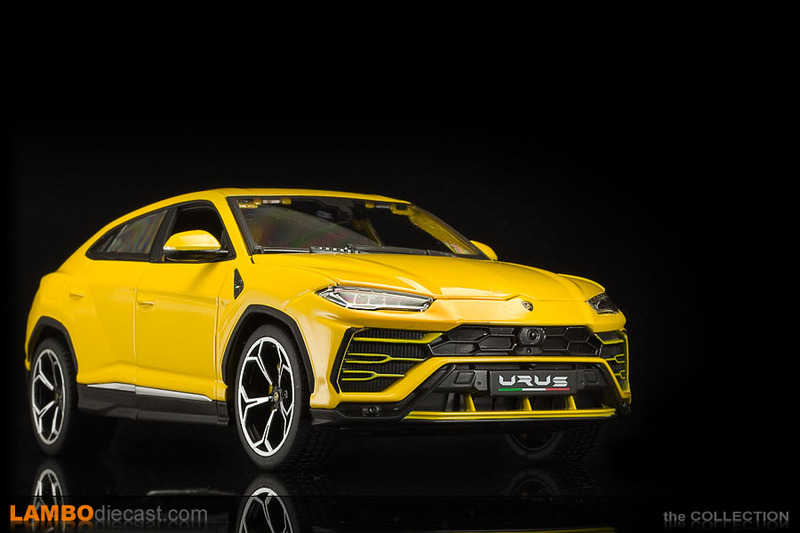 Bburago actually made a really nice scaled down version of the Lamborghini Urus in yellow, the wheel arch extensions, lower side sills, lower front bumper and rear diffuser are finished in satin black while the silver finished 22" Nath wheel replicas cover some nice color-coded brake calipers on this shade. 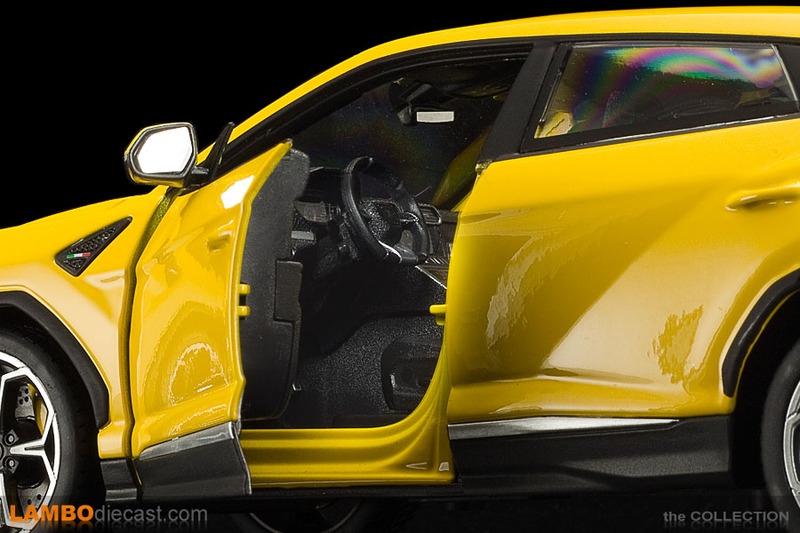 The exhaust pipes, two on either side, are nicely done, too bad they aren't deep enough to give a better feeling of reality, but if you would paint them black I think the look would be a lot better already ... and the same applies to the interior ... on the dark grey Grigio Lynx version this isn't so obvious, but those windshield pillars would look so much better on this yellow version of Bburago would apply a little black paint on the inside. 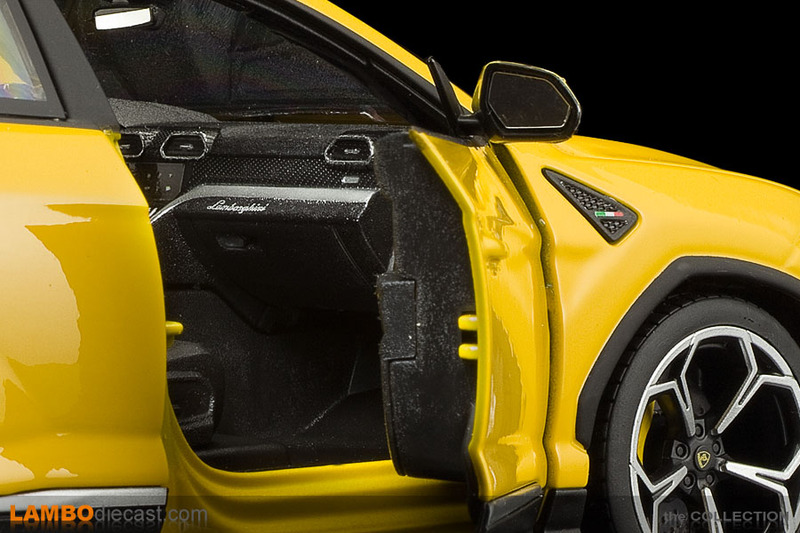 Talking about the inside, again it is all black on this Giallo Auge version, would have been so much better if Bburago would have done a two-tone yellow and black interior, but I guess that would have made the model more expensive. 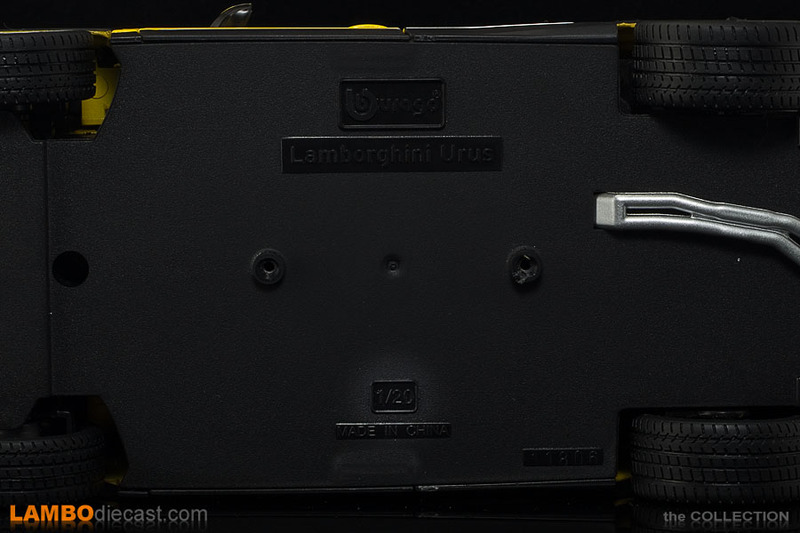 What Bburago did do for this yellow version is use black surrounds on the side windows and for that triangular vent behind the front wheel, check out our review of the Grigio Lynx version and you will notice they went for chrome surrounds on the windows on the vents ... that's a nice attention to detail from Bburago. 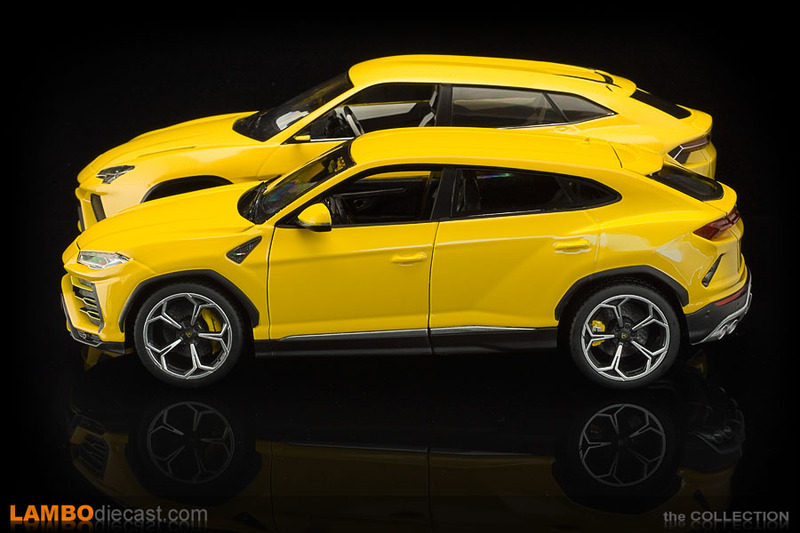 Also note that Bburago actually has a special version of these Lamborghini Urus models for the Chinese market ... over there these models come with full side windows on the driver and passenger doors ... why they didn't release it like that over here in Europe is beyond me, it is, however, fair to say the price for that Chinese version is a lot higher too ... so we might be seeing an 'Exclusive Series' Urus in the future, much like Maisto did with the Lamborghini Centenario. 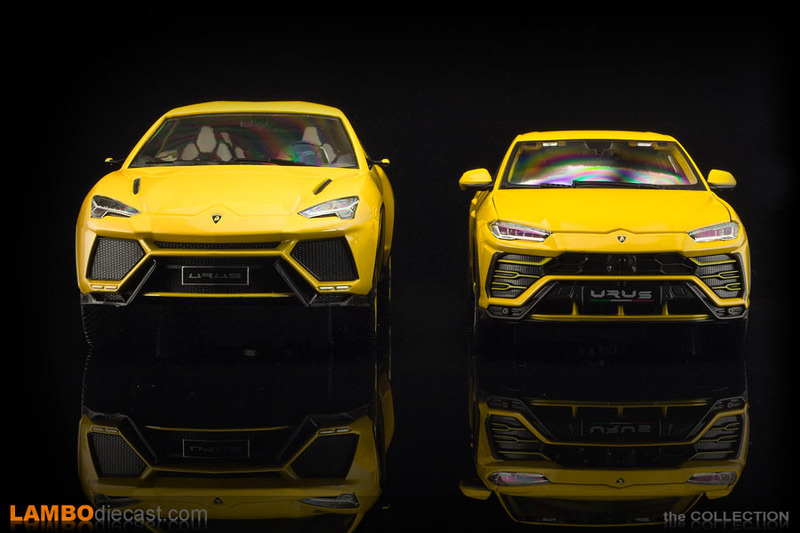 I for one actually prefer this Giallo Auge shade over the Grigio Lynx, but that is my personal preference, the attention to detail is the same for both shades, but I think the yellow makes the design of the Lamborghini Urus stand out better and shows more of the details on the body. 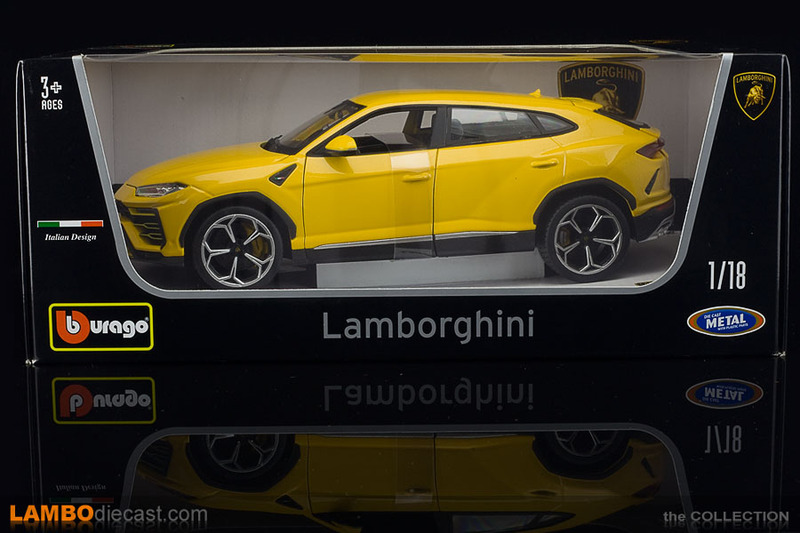 But without a doubt the biggest disappointment about these Bburago made Lamborghini Urus is the scale ... the box says 1/18, but when you look at the bottom of the model it shows 1/20 ... and it just isn't a 1/18 scale model of the Lamborghini Urus, and that is really unfortunate ... it will keep a lot of collectors from buying the Bburago model in the end, because the scale is wrong. 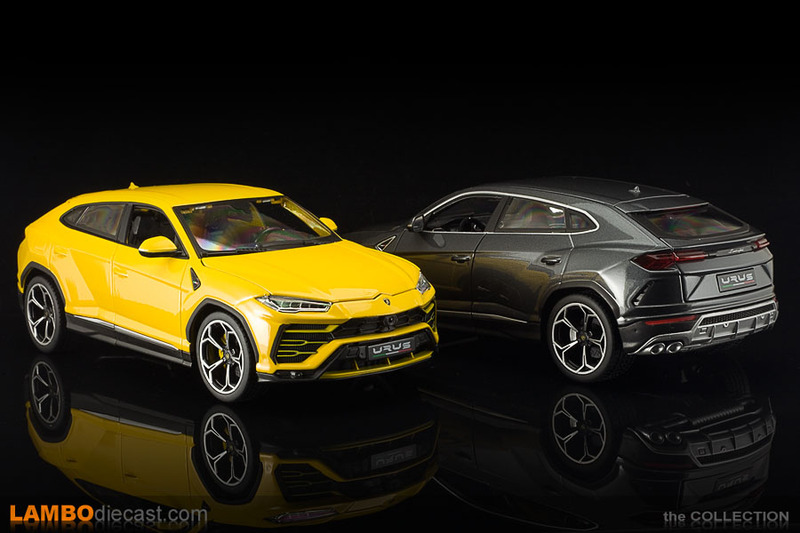 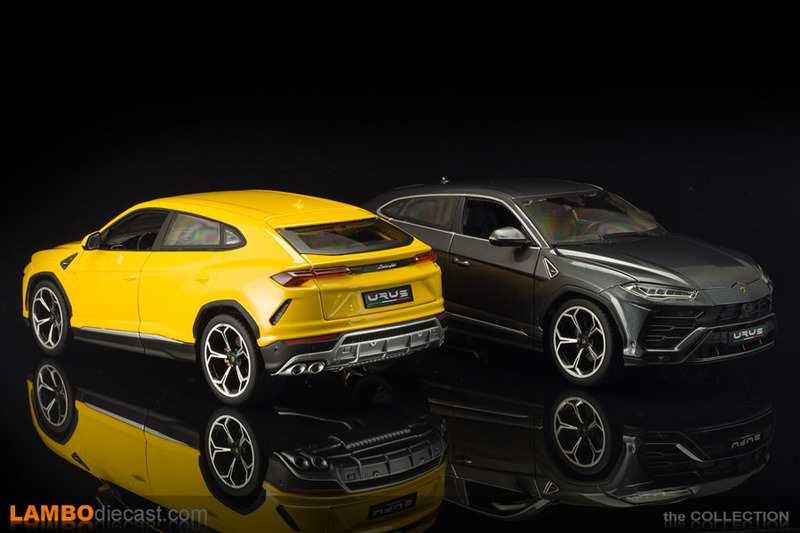 The 1/20 scale Lamborghini Urus is dwarfed by the 1/18 scale Lamborghini Urus Concept ... and that is really disappointing as the Bburago made Urus is really a very nicely done scale model in the end.